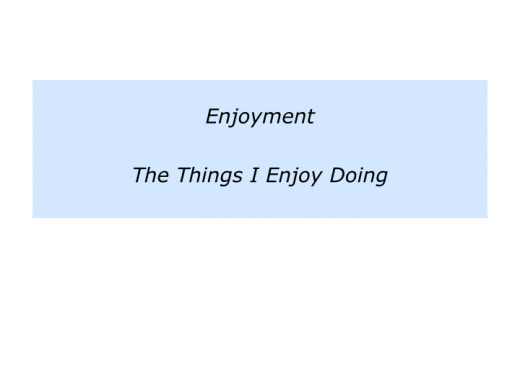 What are the things you enjoy doing? How can you do more of these things in the future? What may be the benefits – both for you and for other people? This was the first exercise I gave to people on strengths courses in the 1970s. Certainly it was basic. But it often helped people to refocus on the things that gave them positive energy. During that decade I spent most of my time running courses in Scandinavia. Most were open courses with around 24 people attending for a week. This led to being invited to run strengths courses in schools, sports organisations and businesses. People were hungry to build on their strengths. We began by exploring the things they enjoyed, rather than endured. 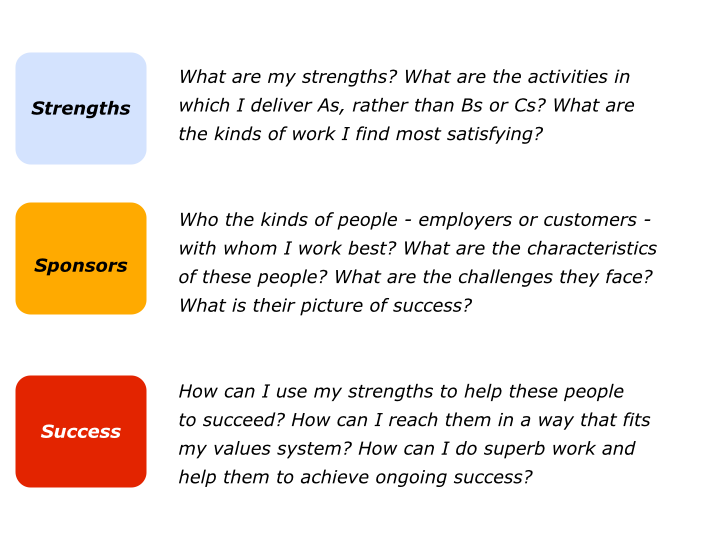 They could then, if appropriate, explore how to build on some of these things to deliver excellence. Developing the enjoyment muscle also helped them to manage challenges. They felt more alive, stronger and more able to find solutions to difficulties. 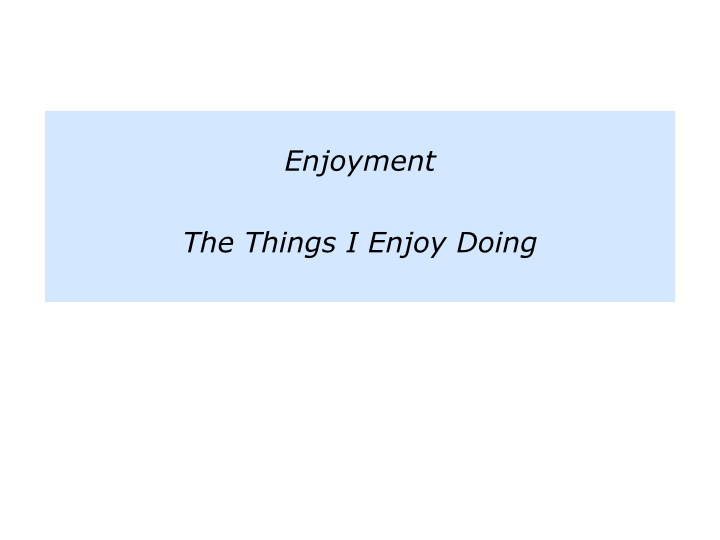 Describe the things you enjoy doing. You may enjoy encouraging people, swimming, walking, writing, cooking, astronomy, being with your children or whatever. 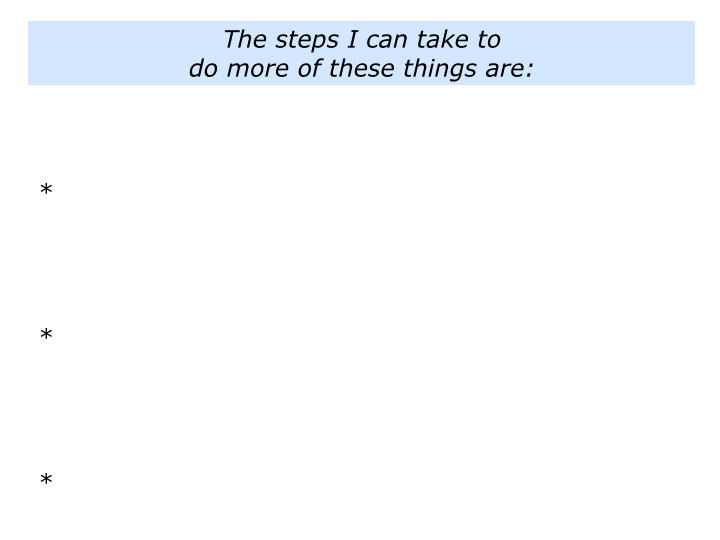 Describe the steps you can take to do more of these things. You may want to focus on three of these things, for example, and make plans for doing more of these in the next month. 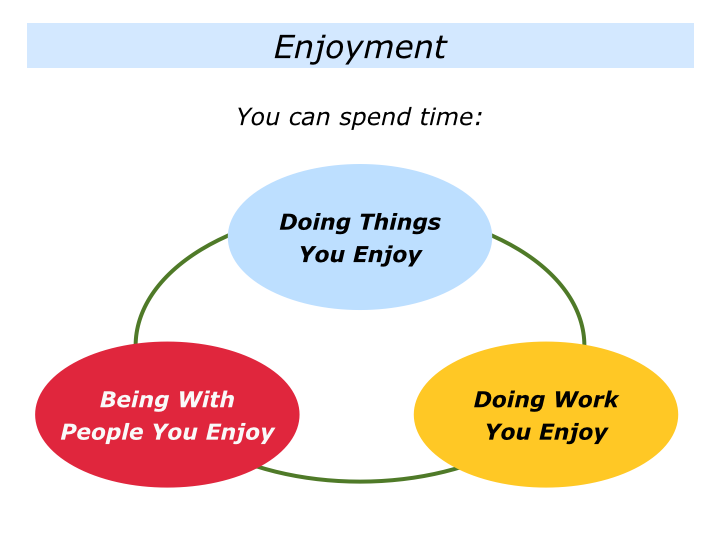 What are the kinds of work you enjoy doing? 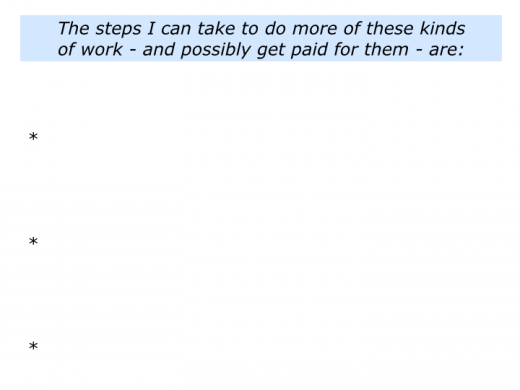 How can you do more of these kinds of work? What would be the benefits – both for you and for other people? During the strengths sessions we focused on the work that people found satisfying. People often chose to take one of the following paths during the 1970s. Some chose to do work they enjoyed and follow a modest economic lifestyle. Some chose to do work they enjoyed and develop a sound economic base by delivering excellent work to particular kinds of customers. 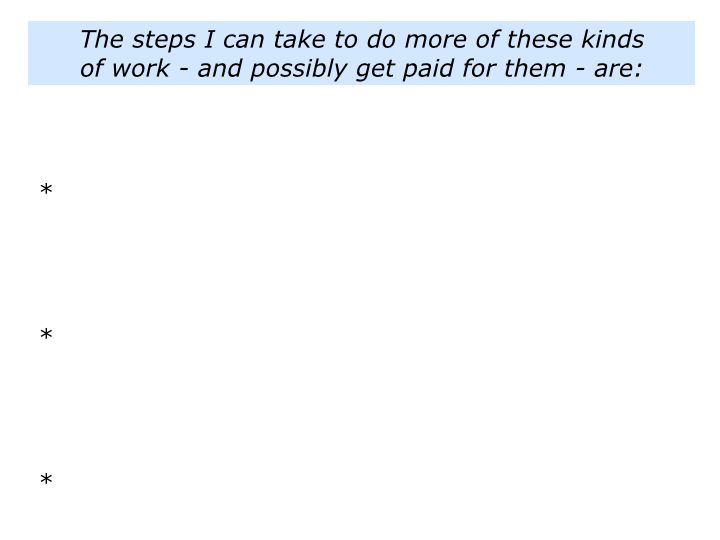 Some chose to do work they endured and hoped that, one day, they would get enough money to do work they enjoyed. Many people who attended the open courses wanted to pursue the second route. Whilst aiming to do work they loved, they also wanted to provide a particular lifestyle for their loved ones. How to build on their strengths. How to find sponsors – employers or customers – who would hire them for what they did best. How to help these sponsors to achieve success. People formed friendships and, in some cases, maintained support networks. They helped individuals to find or create roles in which they could do enjoyable work. Some people went on to create their own businesses, whilst others crafted more satisfying roles in their current organisations. The latter were savvy enough to show how performing such roles would bring tangible benefits to their employers. 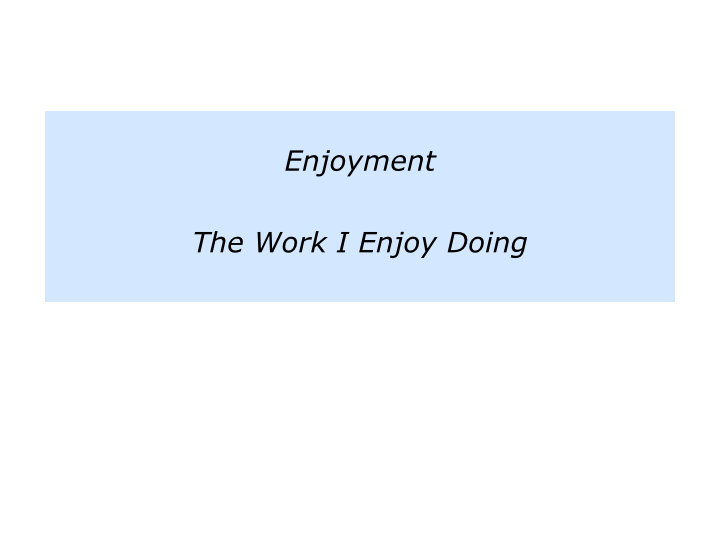 Describe the kinds of work you enjoy doing. Describe the steps you can take to do more of these kinds of work. Who are the people you enjoy being with? How can you spend more time with these people? What would be the benefits – both for you and for other people? 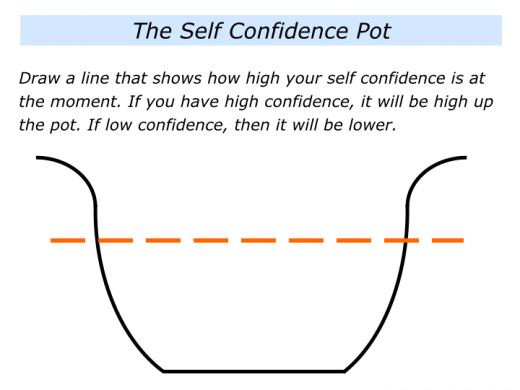 One of the most popular exercises on the strengths sessions was based on Virginia Satir’s concept of the self confidence pot. A great family therapist, she invited people to see their self confidence as a pot. Sometimes they would have lots of confidence in the pot, other times they would have little. This was often related to whether they were surrounded by Pot Fillers or Pot Drillers. Virginia introduced this idea in the 1950s. It was later used by many other people who talked about Energy Givers and Energy Drains. But it is worth going back to her original work. Imagine you are looking at your own level of confidence. Start by drawing an imaginary pot. 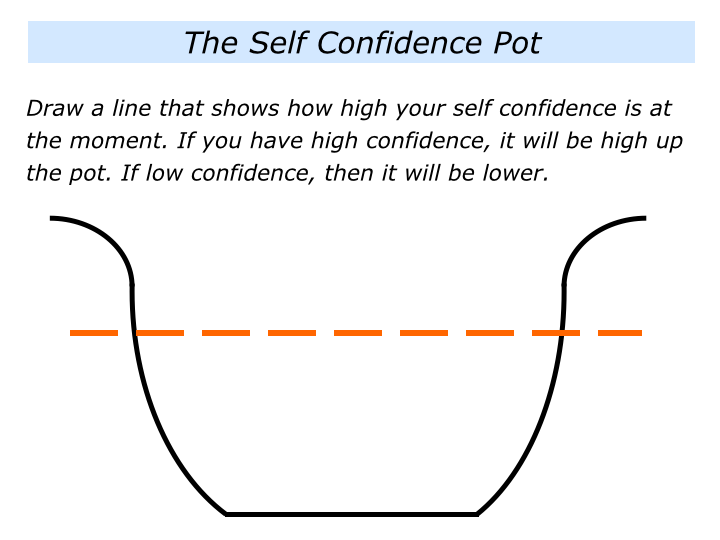 Looking at the pot, draw a line that corresponds with how high you feel your confidence is today. The next step explores why it may be at this level. Write the names of your Pot Fillers. These are the people who give you encouragement and energy. You look forward to seeing them and feel more alive after meeting them. Also, describe the things you do to give yourself energy, such as listening to music, reading, gardening or whatever. If you have lots of things that give you positive energy, then your pot will be overflowing and you will be more able to pass on encouragement to other people. But there may be complications, which brings us to the next part of the exercise. 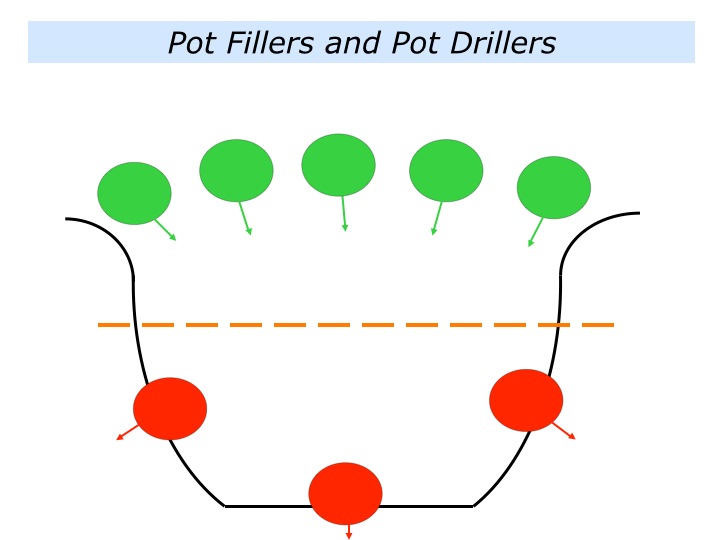 Write the names of the Pot Drillers. These are people who sap energy. They leave you feeling drained and discouraged. The more significant they are in your life, the nearer they will be to the base. You may also do things to drill holes in your own pot. 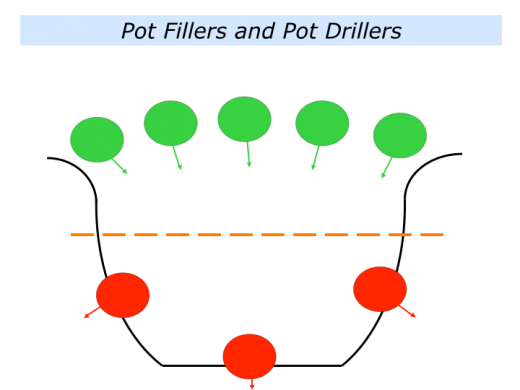 Some people may, of course, be both Pot Fillers and Pot Drillers. They may have a ‘pleasing – hurting’ pattern. Sometimes they are positive then, without warning, they lash out. So how can you get more positive energy? Here are some suggestions. You can learn more via the following link. Spend more time with people who give you energy. Start by spending time with your encouragers. If possible, only work with colleagues you find stimulating. People often find that, as they get older, they spend more time with personal and professional soul mates. Encourage yourself. Do more of the things you love – such as listening to music, skiing, visiting the theatre or whatever. Pursuing these activities will put more energy into your pot. Spend less time – or no time – with people who drain energy. Radical changes are difficult to make overnight but, unless the holes are filled, encouragement will simply flow out of the bottom. You can do several things with stoppers. Stop seeing people who drain energy. They are working for a manager who makes life difficult each day. They are doing work that no longer gives them a sense of fulfilment. So they begin searching for satisfying work with a manager whom they respect. Start making clear contracts with the people who both encourage and stop you. Reward the positive. Give clear messages about the specific things you do like them doing. Explain how you would like to build on these parts of the relationship. Present suggestions, rather than label the person as bad. Don’t expect people to respond immediately; everybody needs time to lick their wounds. Don’t argue or fall into the blame game. What if the person refuses to respond? Then make the decision whether to stay or leave. Be a Pot Filler for other people. Encourage other people and they are more likely to support you. Give and give, but don’t become a victim. Do not stay around to have your pot drilled by people who choose to be miserable or ‘observer critics’. Finally, when in doubt, ask yourself: “Does this activity give me energy?” If not, switch to spending time with the people – and on the activities – that provide stimulation. There are many ways to live life. One approach is to focus on doing the things you enjoy, doing work you enjoy and spending time with people you enjoy. Taking these steps often builds strength to manage the challenging situations in life. If you wish, try tackling the final exercise on this theme. This invites you to do the following things. Describe the people you enjoy being with – write the their actual names. 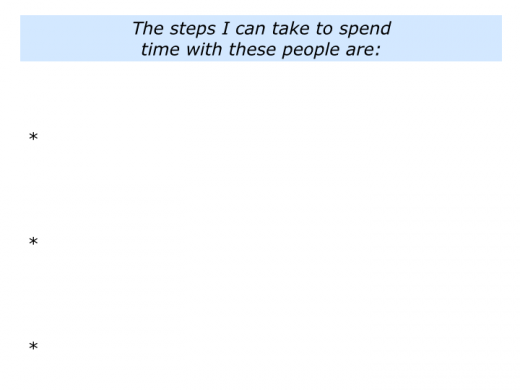 Describe the steps you can take to spend more time with these people.